The Centennial Editions of "You Can Call Me Al: The Colorful Journey of College Basketball's Original Flower Child, Al McGuire" and "Goin' Uptown: Marquette's March to Madness and Return to the Final Four" were recently released to mark the 100th anniversary of the Marquette University basketball program, which began during the 1916-17 season. Both are published by JDM Press of Arlington Heights, IL, the self-publishing firm I created in 2016. 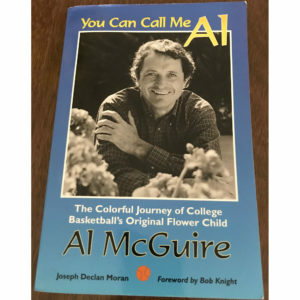 "YOU CAN CALL ME AL" was the first biography of the late Hall of Fame basketball coach and television commentator Al McGuire, and written with his cooperation. He coached at Marquette from 1964-77, winning the NCAA Championship in his final game as head coach. The first edition of the book was published in 1999. The Centennial Edition is the fifth edition of the book. In addition to photos of McGuire's funeral, there is a full photo page of every coach in Marquette history as well as an Introduction which looks back at the beginnings of the Marquette basketball program. This is the full story of one of the greatest and most colorful coaches in the history of college basketball. From the playgrounds of Rockaway Beach, New York, to the NCAA Championship to the broadcast booth, there was only one Al McGuire. This is his story, as quick-paced and fascinating as the man himself. "Al McGuire to me is incredibly insightful regarding people and the game of basketball. He's truly unique and I love him. He is someone I have admired for a long time." "Al McGuire was ahead of his time. His thinking, his philosophy. He had a definite influence on the game of basketball. He was a breath of fresh air. He came in with some new ideas. Another angle. Another play. He took us out of the gym and put us in the sun. Al McGuire helped make coaches celebrities." "Not only did Al McGuire know basketball extremely well, but he also had an uncanny sense of knowing how to translate the information to his players. One of his great attributes as a coach was being able to adjust and adapt during each game his teams played. Al is a truly unique individual, and this will become apparent as you read this book." "Many people, I think, when asked about Al McGuire, would say something to the effect that he has been one of the great personalities in the game of basketball. However, I would go beyond the personality that Al created for himself to say that he quite simply was one of the best coaches ever in college basketball." "I thought I was back in 1977. History does repeat. Good job, Tom." "Joe Moran has done it again. He's chronicled another exciting period in the history of Marquette basketball." "Goin' Uptown" has it right. From Al McGuire to Tom Crean, from Butch Lee to Dwyane Wade, Marquette is back." 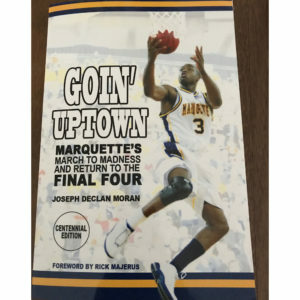 "GOIN' UPTOWN" was published in 2003 after Marquette's improbable run to the 2003 Final Four in New Orleans. The Final Four is considered the Holy Grail of college basketball because it is so lofty a goal and so difficult to achieve. "Goin' Uptown" chronicles Marquette's incredible 2002-03 season and its march to madness. The book examines the season, tournament run, and how its fans took over Bourbon Street in the Big Easy. Moran also takes a look at the resurgence of the basketball program under young fourth-year coach Tom Crean and how he built on the program's foundation laid by Al McGuire's own improbable national championship in 1977. Moran takes readers through that championship run as well and compares both coaches and the ways in which they made their personal journey for the Holy Grail. While Al McGuire's journey to the championship validated his coaching career, Marquette's journey with Tom Crean at the helm validated Marquette's return to the elite of college basketball. This Centennial Edition was released in June 2017. It is the second edition of the book.